Two weeks ago, we started working on opinion writing in my first grade classroom. Last year, I did lots of rethinking about how I wanted to teach opinion writing to my little ones. After spending lots of time reviewing the writing strands of the common core, pouring over possible mentor texts and thinking about the best way to scaffold graphic organizers I decided to create my own opinion writing unit. I created Writing My Opinion to cover the K, 1st and 2nd standards from the common core writing anchor standard 1. The unit includes different graphic organizers (one that supports writers working on the K standard, another for the 1st grade standard and one for the 2nd grade standard) for differentiating opinion writing. It also includes 3 different rubrics, 3 different self reflection forms, pieces to make a reusable anchor chart, a list of mentor texts to use for opinion writing and 10 writing prompts for your students to use as they are being introduced to opinion writing. I introduce each type of writing that we do throughout the year by reminding the students that authors organize their writing in different ways. We added opinion writing to our "Ways Authors Organize Text" anchor chart a couple weeks ago. 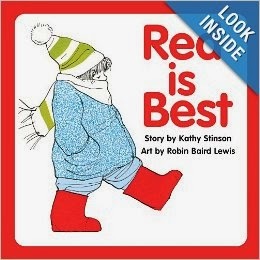 I introduce opinion writing by using the mentor text Red Is Best by Kathy Stinson. After reading the book, we used my reusable opinion writing anchor chart to highlight the topic, opinion, supporting reasons, and conclusion as modeled by the author of this book. That really helped the students focus their own opinions. The pieces to make the reusable opinion writing chart are included in the Writing My Opinion unit. After I made the chart, I laminated it and then I use large sticky notes to change the things we add to match each different topic that we work on together. When the students were ready, I introduced a topic that I wanted them to try to write about. We used the "best ice cream sundae topping" as our first opinion writing topic. I knew there would be a high level of motivation involved. I modeled first with my own opinion about my favorite topping. I used the reusable chart again for the modeling. I am super proud of how their writing turned out. When they were finished, I typed their writing and we published them and turned the collection into a class book. With the help of my fabulous parents, we also had an author's celebration with real ice cream sundaes! 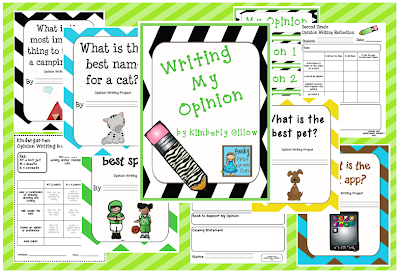 You can check out the Writing My Opinion unit and my other products by visiting my Tpt store. It's almost time for the cyber Monday/Tuesday sale! I'm signing off to start filling up my Tpt shopping cart for the Cyber Monday/Tuesday sale! I fell like I am needing some help with my teaching of writing. I need to check out this pack. thanks for sharing. Love that anchor chart! Adding your pack to my wish list!